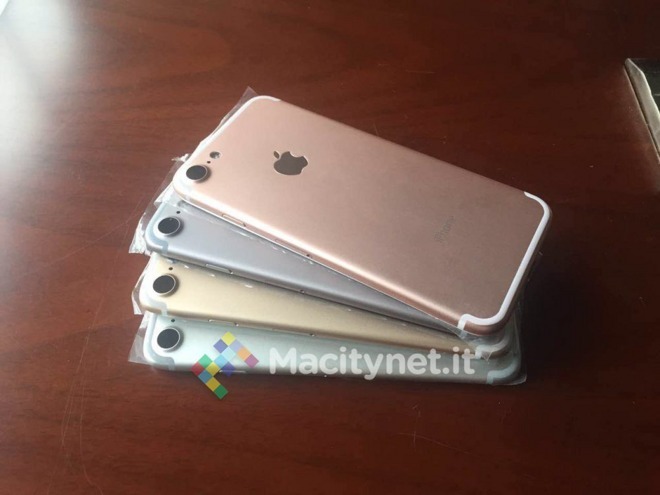 A newly-published image of alleged dummy "iPhone 7" models for accessory manufacturers suggests that Apple will ship the device in the same colors as the iPhone 6s, despite recent reports of new or altered color options. The dummies generally match previous leaks for the device, according to Italian site Macitynet. This includes antenna bands located near the top and the bottom, and a large, bulging opening for the camera. In fact a slight difference from some other leaks is that the camera bulge appears to come from an extrusion of the case material, rather than a separate metal ring, as on the iPhone 6 and 6s. This creates a more seamless design. One recent rumor claimed that Apple might introduce a "Deep Blue" color option, supposedly replacing the "Space Gray" available since the iPhone 5s. This was later corrected to suggest that Space Gray would stick around, but in a much darker shade, closer to something like the iPhone 5. A questionable aspect of the Macitynet leak is that the source of the image claims Apple could indeed release three versions of the iPhone 7, including Plus and "Pro" models. While some other reports have mentioned the possibility of a Pro, it's commonly expected that Apple will only release two models —a standard and a Plus —when the iPhone 7 arrives this fall, most likely in September.